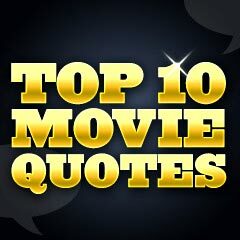 Top 10 Most Famous Movie Quotes: These are the ten most recognizable film quotes according to a 1998 survey of a group of "10 film critics and experts" who were asked by Guinness to draw up a list of the "ten most famous movie quotes ever." According to the publication's editors, "We were looking for quotations that were accessible and that had popular appeal on a global scale. We were also looking for wit and delivery. Delivery is important." The films chosen ranged from 1930 to 1994, and six of the 10 were from the 1930s and '40s. See also the Top 10 Best Movie Lines Ever according to Odeon Cinemas (UK) in 2003, with some duplications, the Top 10 Best Comedy Lines From Classic Films according to TCM, and the Top 10 Greatest American Movie Quotes, according to AFI. 2. "Of all the gin joints in all the towns in all the world, she walks into mine." 3. "Well, it's not the men in your life that counts, it's the life in your men." 5. "Would you be shocked if I put on something more comfortable?" "Won't you excuse me for a moment while I ... slip into something a little bit more ... comfortable?" 6. "My Mama always said, 'Life was like a box of chocolates; you never know what you're gonna get.'" 7. "I could dance with you till the cows come home...On second thought, I'd rather dance with the cows when you came home." 8. "Frankly, my dear, I don't give a damn!" 9. "You talkin' to me? You talkin' to me? You talkin' to me? Well, who the hell else are you talkin' to? You talkin' to me? Well, I'm the only one here. Who the f--k do you think you're talkin' to?" 10. "Gimme a whiskey, ginger ale on the side. And don't be stingy, baby."